Don’t love money; be satisfied with what you have. 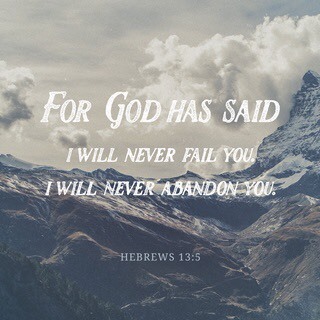 For God has said, "I will never fail you. I will never abandon you." Today the day the Lord has made, this prayer time with Jesus. today’s reading and devotion. My family, my health and True Image Landscaping. Dear Lord God, Abba Father, thank You for today and all Your blessings. For watching over me and mine. O that You will continue to bless us, keeping us from evil and causing pain. I lift up to You all those who are alone, in pain or suffering. I pray for our leaders, that they feel the conviction of the Holy Spirit and find the courage to do what is right in Your eyes.